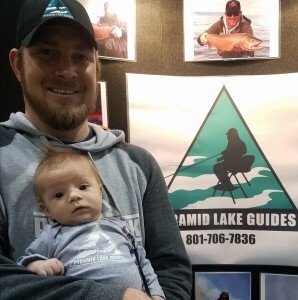 Join us at our booth at Expo Idaho this weekend! 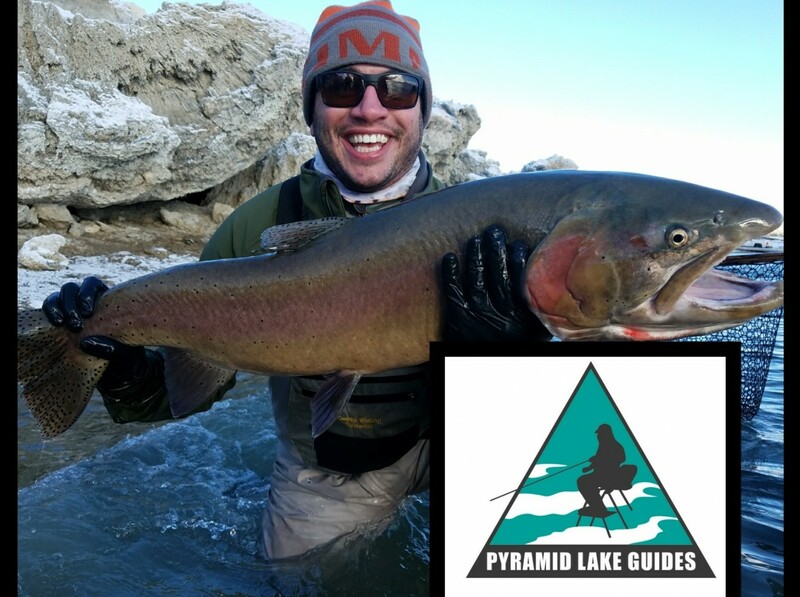 We will be presenting on Pyramid Lake at 7 p.m. Friday night. Come chat with us about going after these monsters! Need last minute gift ideas for that special angler in your life? 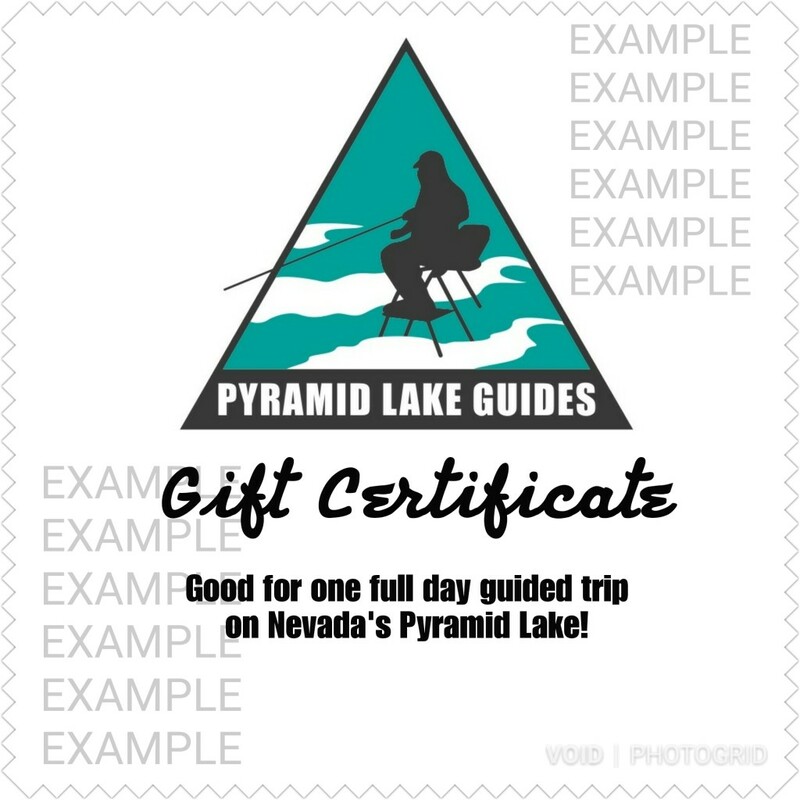 Consider a giving a guided trip on Nevada’s Pyramid Lake! Full or half day gift certificates available electronically. 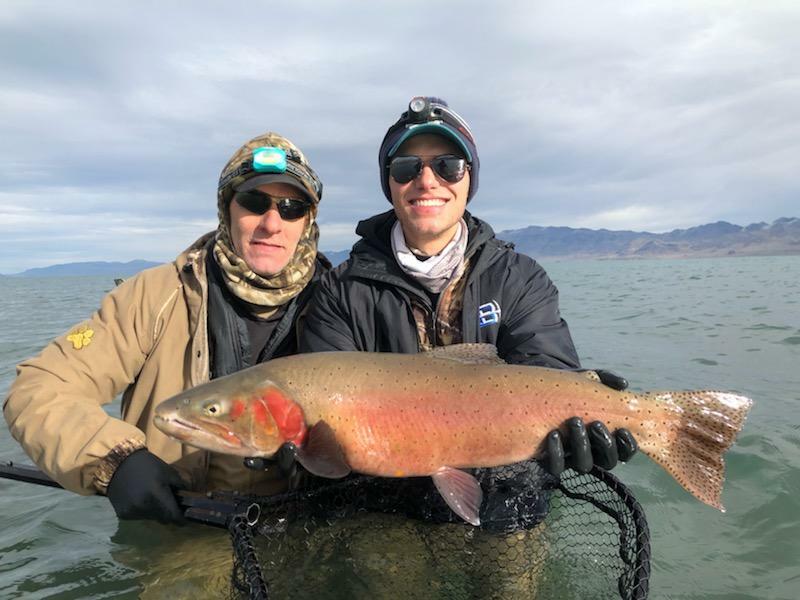 Steve and his son landed some nice ones this past weekend! We had a good day with Rob and his son Drew! A big one got away! 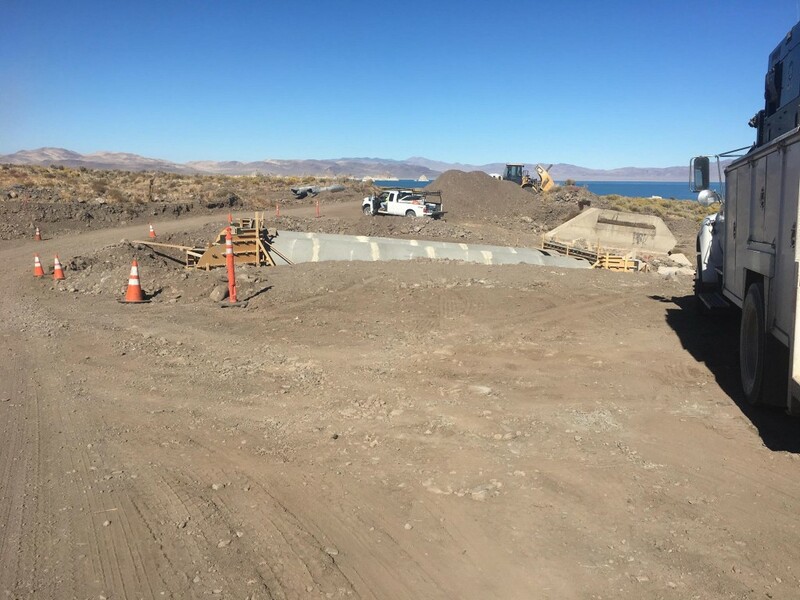 The road to Monument is being worked and is expected to open within a few weeks. 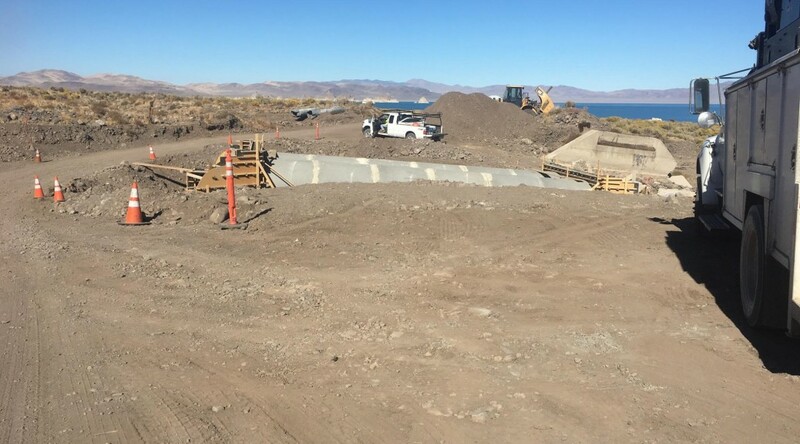 Thanks to the Pyramid Lake Paiute Tribe for all their hard work, we look forward to fishing the north end of the lake again soon! 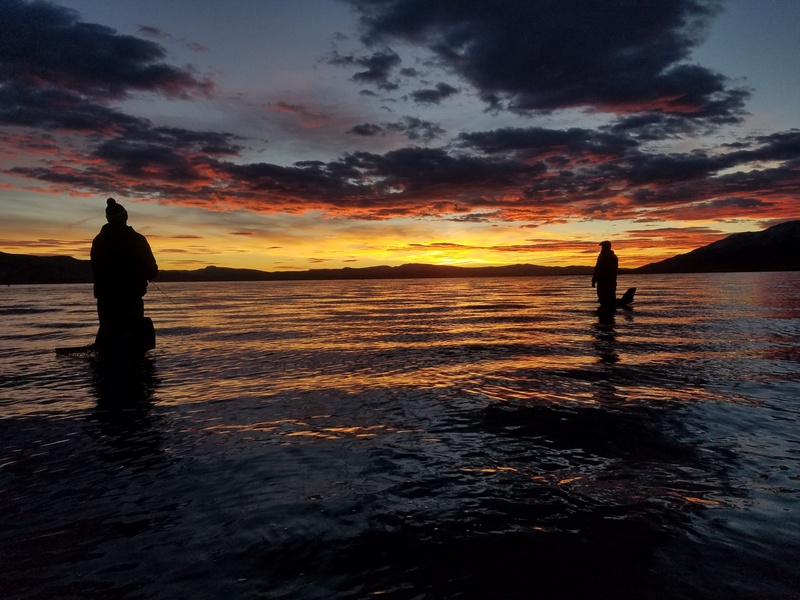 WHEN IS THE BEST TIME TO FISH PYRAMID LAKE, NV? We get asked this question A LOT. There’s no short answer to it, and it greatly depends on who you ask. It also depends on what you are looking for– numbers? no crowds? fair weather? best chance for a 20 lb. cutthroat? shore, boat, or float tube fishing? indicator or streamer fishing? etc. It all depends on what you are after. Here’s a monthly break down of what we see season after season and our recommendations. 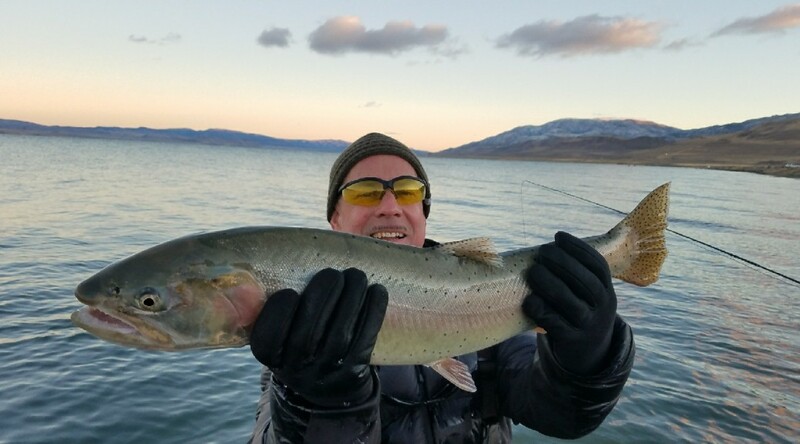 Keep in mind that when asking this question you must consider the source; many of our guides live on the lake and fish it every day Nov-March whether for work or play. The opener on Oct. 1 is a very popular time. 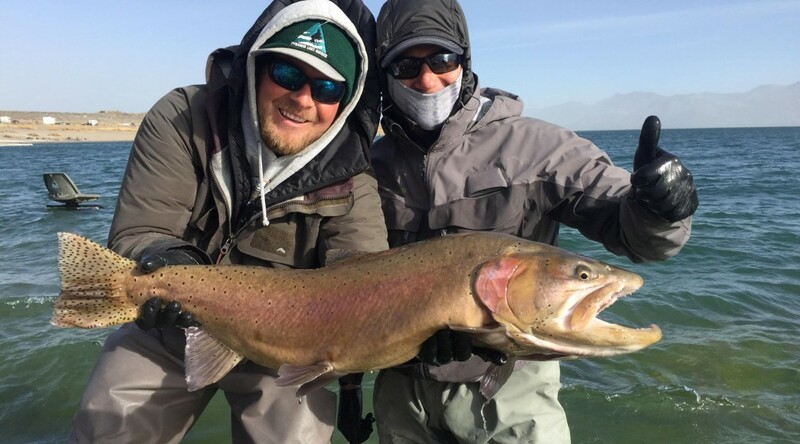 The excitement is high, as anglers have waited 3+ months to have access to these massive lahontans once again. Expect it to be quite crowded on the beaches. The weather is still generally pretty mild and can be quite warm, including the water temps. 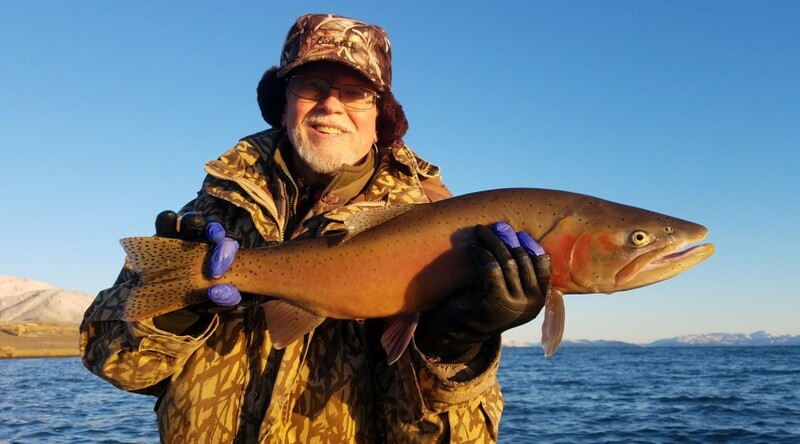 Float tubers and boaters tend to do better fishing wise during October into mid-November; the big cutties prefer colder water temps before coming into shorelines. Bait balls can still be seen around this time. If you’re looking for prime shore fishing shoot for the later days of November when water temps have cooled. 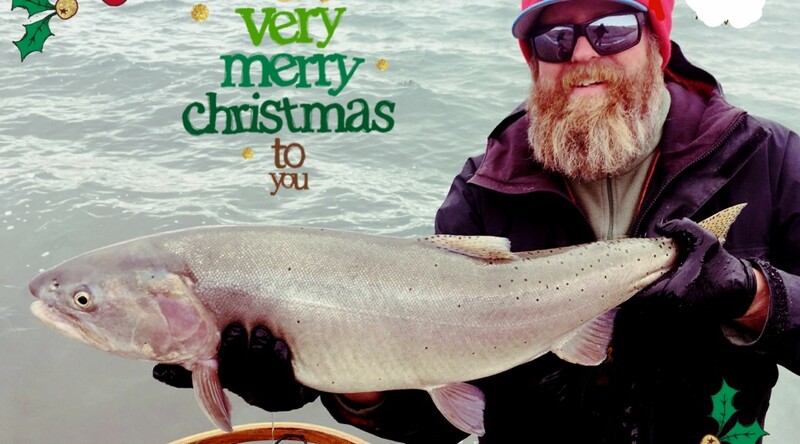 December is typically great for large fish. 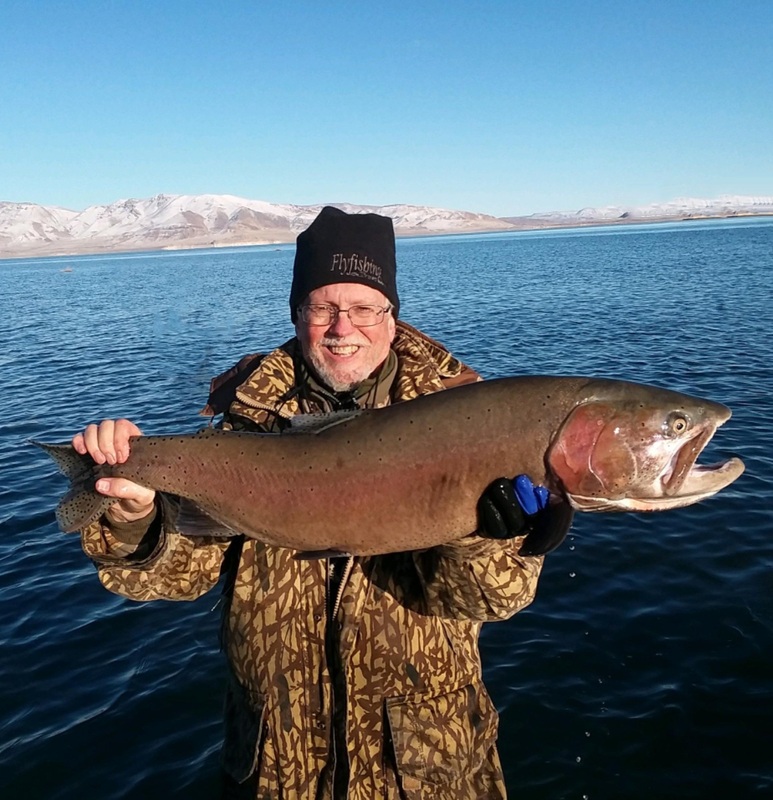 Some of our biggest fish have come during December and at a fairly consistent rate. The lake has turned over and the water temps have dropped, making ideal conditions for the cutties to come into shore. Crowds are usually minimal. If you can sneak away around the holidays this can be one of the best months on Pyramid. January can slow down a bit and weather can be highly unpredictable. 2018 January was exceptionally warm and calm making the fishing slowwww. 2017 January was exceptionally wet resulting in flooding and lake closure for about 6 wks. 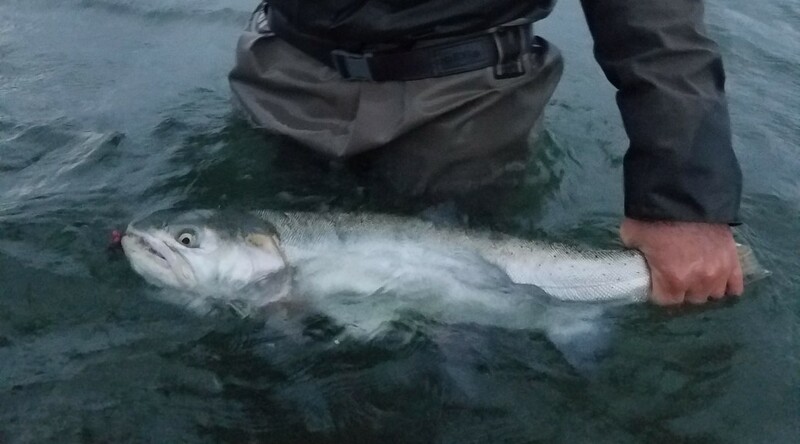 2016 January was very cold and had slow fishing but good quality and size of fish when landed. The crowds are pretty much non-existent in January. February is similar to December and is also one of our favorite months to fish. The water temps are ideal, the crowds are minimal, and we start to see the pre-spawn. If you can do February you’ll most likely leave the lake happy. And that brings us to March. Many will answer this question with March, during the spawn. March does tend to have great numbers fishing wise, but along with them come the crowds. Beaches are filled with anxious anglers making getting a decent spot on the beach with your ladder quite difficult. If you want to skip the competitive crowds skip March. 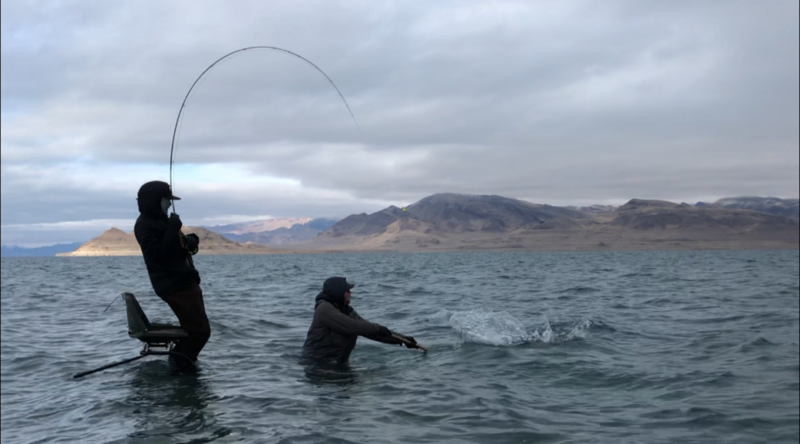 Also, keep in mind that numbers don’t necessarily mean BIG fish, the smaller stockers can fill up your line all day and you might not see a 10+ lb trout. And if you do consider yourself lucky! Early April can be good, but still crowded. Many anglers are looking for warmer/calmer weather and inquire about the spring months as a result. 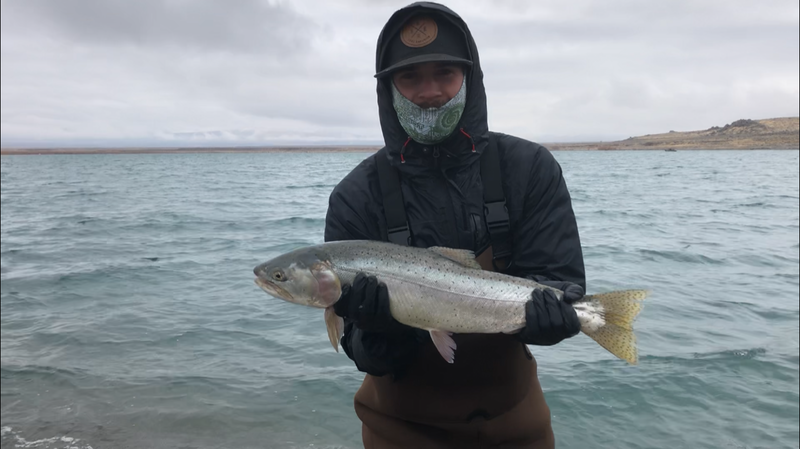 The main problem is that water temps start to rise and these lahontans go deep, they really prefer cold windy days pushing their food up into the waves of the shoreline. If you must do April try the first half. Into late April and May you’ll see similar conditions as October-early November. Float tubers and boaters will generally have better luck. As the weather warms the fishing will die down, we don’t recommend shore fishing May-June 30 as a result. And if that’s your only time to go make the best of it! No matter the time you go we hope you enjoy your time on Pyramid, and please remember to read all Tribal regulations ahead of time. Whether you are planning a DIY trip or looking for a guide don’t hesitate to give us a call or email with your questions! 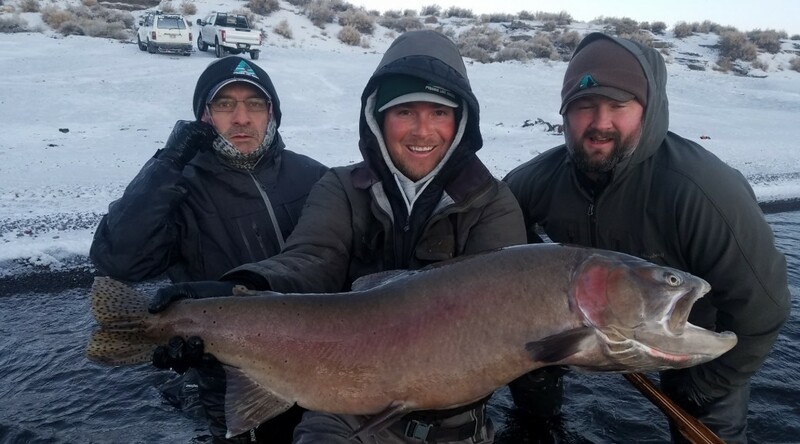 Ted from Boise landed a beauty today! 14 pounds weighed. 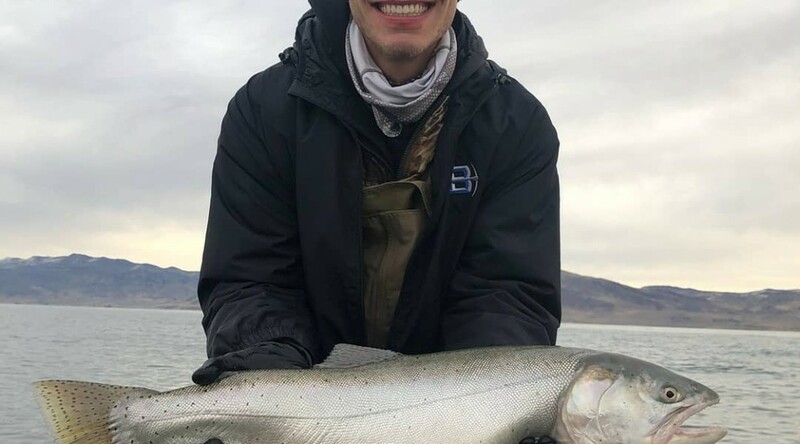 It was cold but fishing was good! 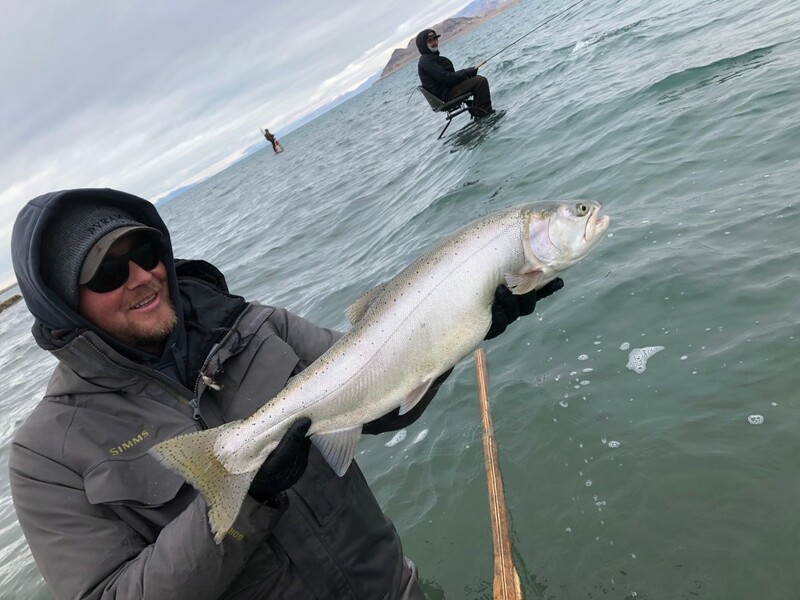 The strip bite was more productive than indicator fishing for us this cold Tuesday. More storms coming! The air temperatures are finally dropping, so we are hoping that means the water temps will drop as well. 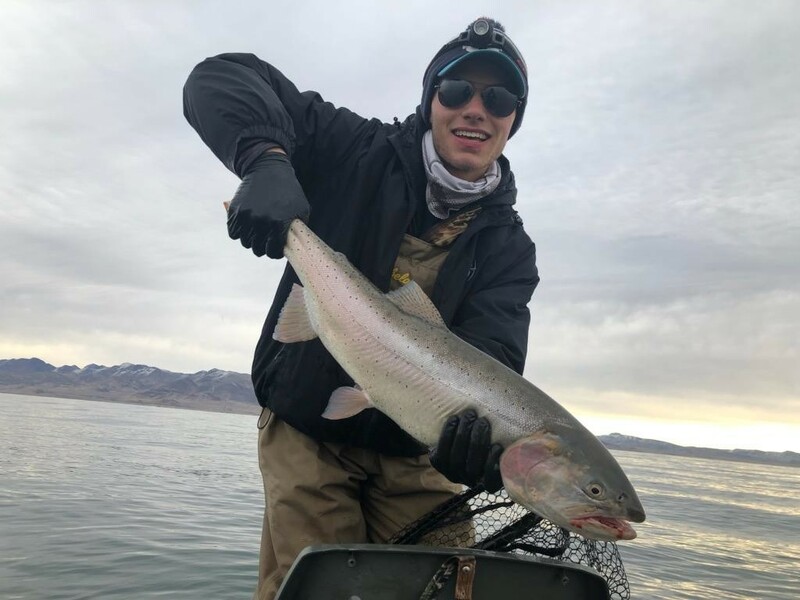 The fishing throughout November was relatively slow although some big ones were landed in the area. We’ve had a great time the last few days with Dave McDonald out from Dutch John Utah and Craig Vares out from Chico California. These guys are serious anglers and are more than willing to brave the cold temps and put in the hours. 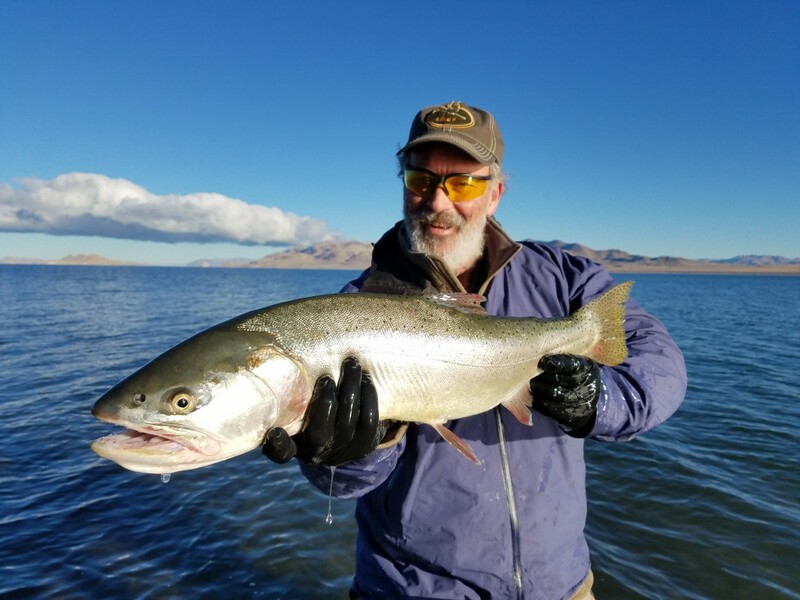 They’ve landed some nice Lahontan Cutties so far! 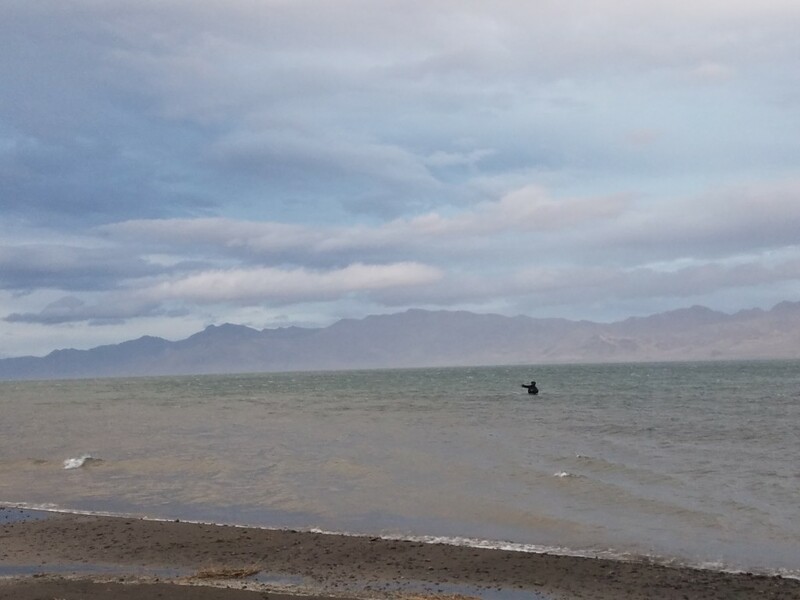 The warm and calm weather seems to have put a damper on the fishing on Pyramid Lake. 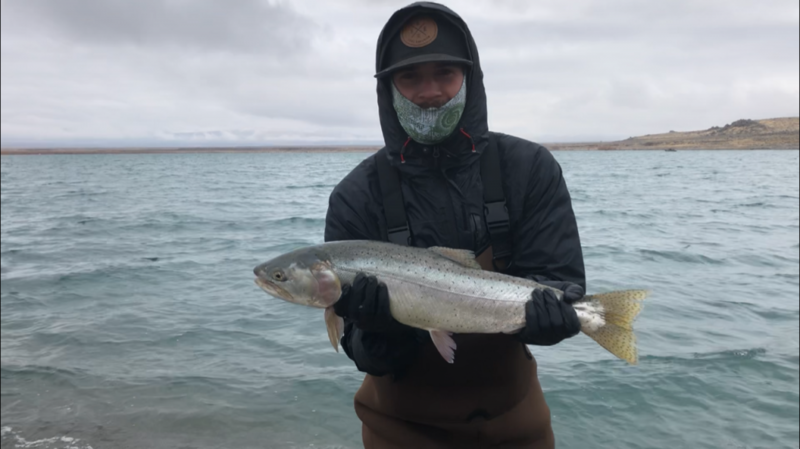 Fish are still being landed but it is relatively slow, and anglers are really needing to put their time in to land fish. This lake takes patience. Typically it really turns on after Thanksgiving so let’s hope this year is the same. A nice windy storm rolled in today, and the temperatures dropped around midday so let’s hope that carries over to the water temps. We still like that magic hour, we landed three around dusk! The season is underway and reports are good. Float tubers are doing well with their lines in deeper waters. 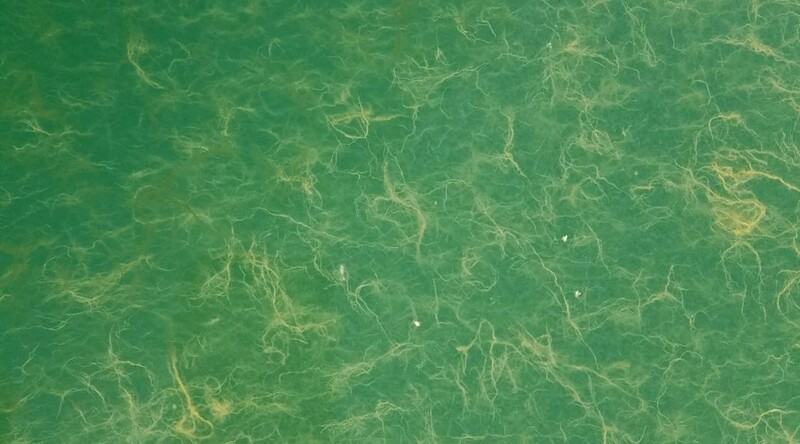 The lake has a large algae bloom right now, once it clears out the shore fishing should get really good! 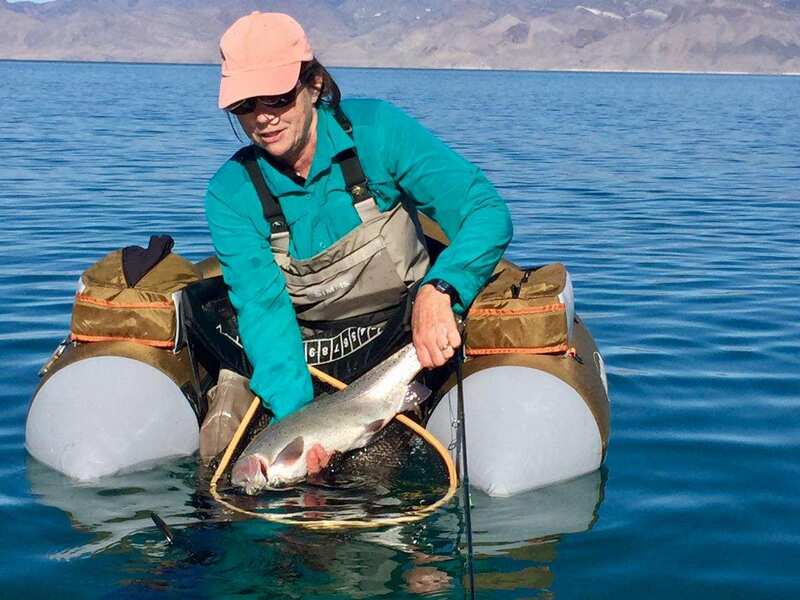 Zandie landed this nice Lahontan Cutthroat while float tubing on Pyramid Lake, NV.